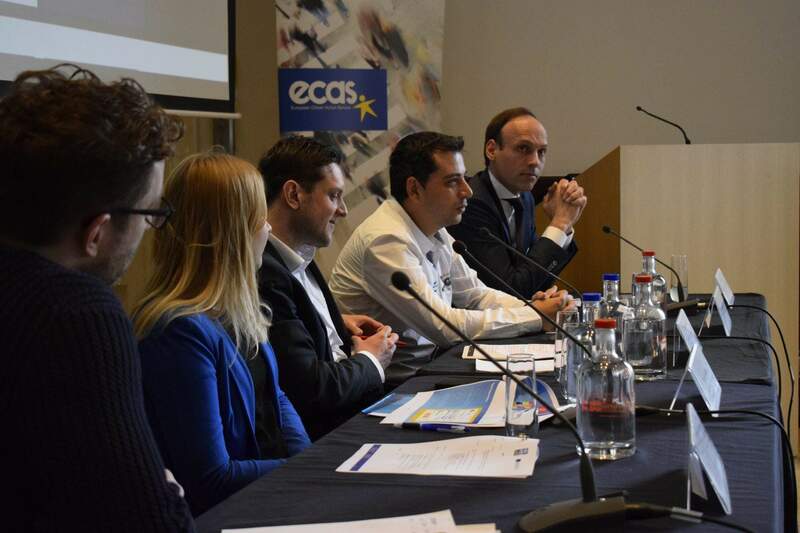 ECAS was present at this year’s European Youth Event (EYE) as a group organiser to host a workshop on youth e-participation. The workshop “EU digital toolbox for successful e-participation” took place on Friday 19 May in Strasbourg and was co-animated by ECAS’ Digital Democracy Coordinator, Elisa Lironi, and Outreach and Membership Manager, Marta Pont. 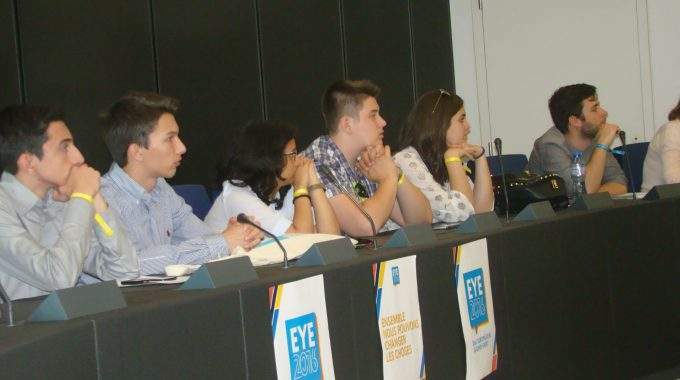 The EYE is an annual event organised by the European Parliament to give young Europeans the opportunity to exchange ideas and make their voices heard. 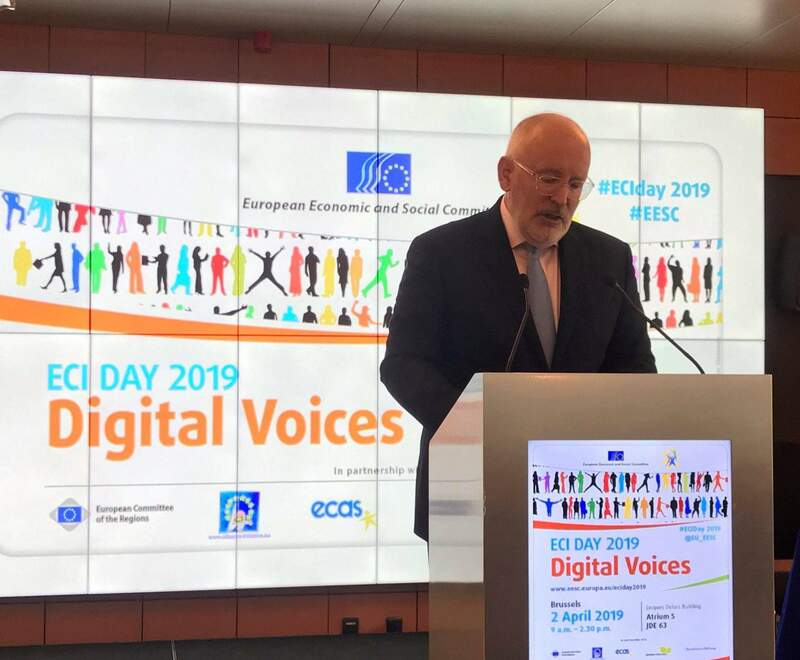 The aim of ECAS’ workshop was to test the young Europeans’ familiarity with and interest in using digital tools as a way to engage with decision-makers. The workshop was greatly attended, with almost 40 participants, who actively participated in the anonymous online poll that was organised to collect their views on a number of ideas linked to e-participation. The poll exercise was divided into 3 sets of questions. The first set was comprised of general questions that aimed to know the participants’ familiarity with some basic concepts such as ‘e-democracy’, ‘e-participation’ and ‘crowdsourcing’, as well as ‘EU e-participation tools’. After this icebreaker, ECAS gave a short presentation on the meaning of e-participation and the existing instruments and practices at national and at EU level, including the European Citizens’ Initiative, the online EU public consultations, the petitions to the European Parliament, as well as other platforms developed by EU institutions to consult stakeholders such as Futurium. 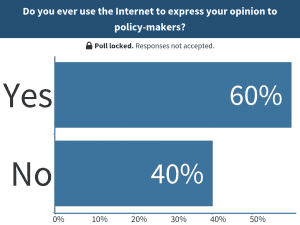 The second set of questions focused on active youth e-participation and was about how much participants used and trusted the Internet to express their views to policy-makers and what their fears are when using these tools. The last set of questions focused on crowdsourcing and its potential and challenges at the EU level. Based on the responses, the participants were divided into two groups. 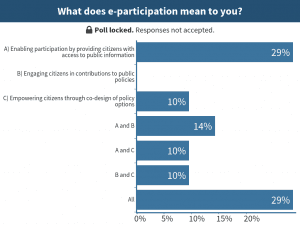 One group considered e-participation to be about providing citizens with access to public information (29%), while the other group believed e-participation is about three aspects: allowing access to public information, engaging citizens in contributions to public policies and empowering them through the co-design of policy options(29%). 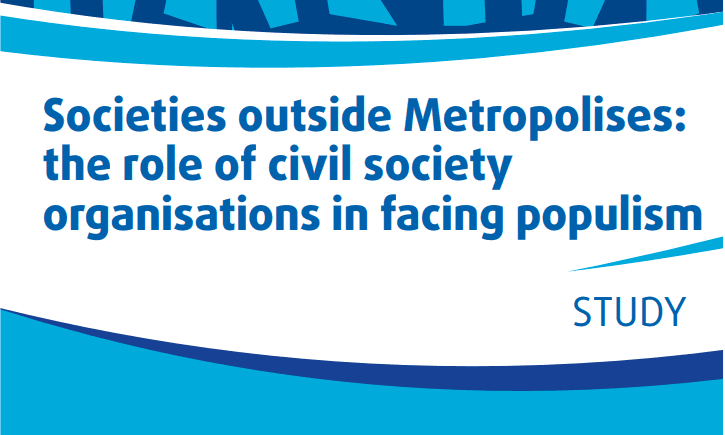 This confirmed the idea that e-participation is a multifaceted concept. 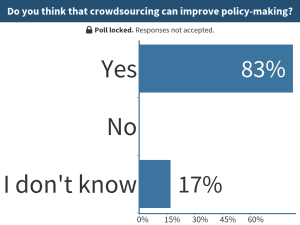 Close to 60% of participants did not know before the workshop what ‘crowdsourcing’ meant, even though as many as 60% said they had used the Internet to reach out to policy-makers. 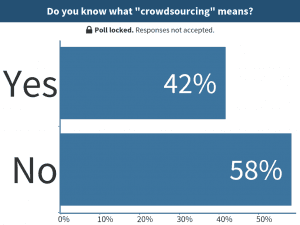 After listening to ECAS’ presentation, though, during which the concept of ‘crowdsourcing’ was explained, as many as 83% stated that crowdsourcing could actually improve legislation, against 17% who said that they ‘did not know’. 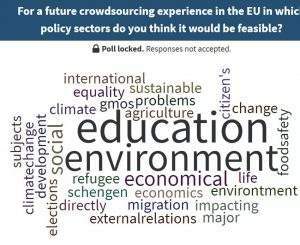 As for the sectors in which a crowdsourcing model could be applied at the EU level, education and environment stood out as main fields. 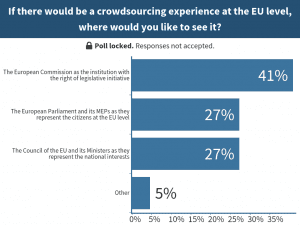 According to the participants’ answers, the European Commission as the EU institution with the power to initiate legislation should be the main target of a crowdsourcing model at EU level (41%). Among the most widely used online tools Facebook stood clearly out, followed by Twitter. 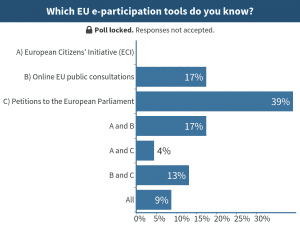 With regard to the e-participation tools available at EU level, petitions to the European Parliament seemed to be the most known by participants (39%), followed by online EU public consultations and ECIs (17%), and online EU public consultations alone standing on equal footing (17%). 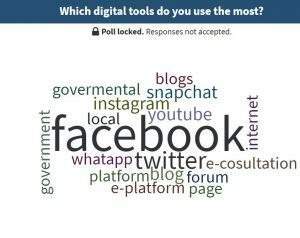 Another interesting finding of the poll was that participants’ main fear when using digital tools is that information can be later held against them (42%), followed by data protection concerns (31%).